We always ensure that the professional garden and grounds maintenance services that your care home requires are consistently delivered to the highest standards, but the team here at Ricky Tyler Landscapes know it goes further than that. We need to be sympathetic to your environment and empathetic to the needs of both staff and residents, while delivering the services you require with the minimum of fuss, and in a manner and at a time that best suits your needs. Our garden maintenance services include: grass cutting, leaf and litter clearance, hedge cutting, strimming, and weed and moss control. 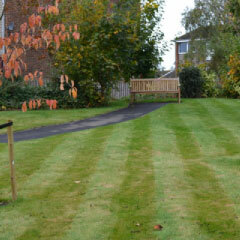 What you gain when you trust us with your care home grass, hedge and garden maintenance? Having spent more than a decade delivering highly-regarded services to more than 1,500 residential, commercial and private properties, Ricky Tyler Landscapes knows how to provide the weekly, fortnightly or monthly service you need to maintain the best environment for any care home. Our hugely experienced staff are regularly trained in the latest procedures. Where possible, we use the same team for every visit, as they know your environment best. Our fleet of branded vehicles and smartly uniformed staff means you always know exactly where we are at work. Every member of our team is fully CRB checked, and our own strict quality control procedures and no-notice spot-checks of the work we undertake ensure that the highest standards are always achieved. You can also review our essential public liability, employers' liability insurance, and health and safety policies. To maintain the best results, all of our tools and equipment are replaced annually, and as an environmentally friendly business, all garden waste is always removed from your site as we work, and is then recycled and composted where possible. Contact us now to discuss the needs of your care home. Each project and location is unique, therefore please call 01707 324 262 or 07986 224 09 now to discuss your care home requirements during a free initial consultation. If you prefer, you can use the contact form to the right. 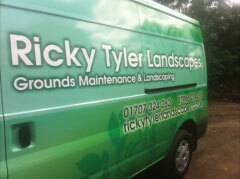 Ricky Tyler Landscapes can provide gardening and grounds maintenance services including Care Home Garden Maintenance covering London, Essex, Hertfordshire, Northampton, Buckinginghamshire & Bedfordshire .